ATLANTA, June 30, 2016 – With the U.S. Open just a few months away, the build to the season’s final slam begins on the hardcourts of Altanta, Ga. Three-time defending champion John Isner will be in action, as will 1996 Olympic hero, Andre Agassi, in an historic rematch against Atlanta silver medalist Sergi Bruguera. This year the tournament’s organizers have turned to New York based Seaters, to help sell out the event and build a tournament that no tennis fan will want to miss. Seaters helps fans that want to attend live events, get tickets and the best experience possible. 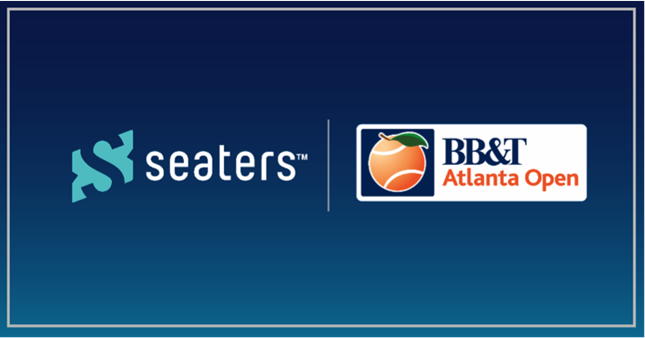 “Seaters is excited to add the BB&T Atlanta Open to its portfolio of tennis tournaments we partner with on a world stage. We believe the BB&T Atlanta Open to be one of the up and coming prestigious events in tennis today,” states Jean-Sebastien Gosuin, CEO of Seaters. Seaters, the innovative marketing activation technology engine with offices in Brussels, Paris, London and New York, assists organizers in creating great experiences at their top events. Seaters works closely with the tournament organizers to put real fans in seats and help bring the live experience of attending sports and music events to the local community. In 2015, Seaters was selected by Le Tremplin, to take part in the sports technology acceleration program of the city of Paris. Earlier this year Seaters also won the Digital Innovation of the Year award by SPORSORA, the French Sports Marketing Association. With partners like the BB&T Atlanta Open, their intention is clear, to put their stamp on the U.S. Market. Seaters is working to bring a special experience to this year’s tournament in Atlanta and tickets are selling out fast. You can get yours at https://www.seaters.com/bbtatlantaopenexclusive, along with a chance to receive free sponsor tickets. Check out Seaters today. Seaters is the marketing technology company headquartered in New York with office in London, Paris, and Brussels. Seaters aggregates demand for time sensitive/perishable assets. By aggregating demand in advance, Sponsors and Event Organizers have a targeted single source of pre-qualified fans. As tickets become available, Sponsors and Organizers can immediately distribute them with a click of a button. Seaters is fan friendly and does not scalp tickets. No ticket distributed through the Seaters platform is ever higher than face value. Oftentimes sponsors distribute their tickets free of charge to the fan. Fair treatment of the consumer and management of expectations are guaranteed by the patent pending Likelihood Algorithm. The BB&T Atlanta Open is held each year in July in Atlantic Station and is one of eight summer tournaments in the Emirates Airline US Open Series. The tournament features men’s top world tennis players in singles and doubles competition. Approximately 40,000 fans attend the tournament and bring an estimated economic impact of $10.3 million to Atlanta. John Isner holds the 2015, 2014 and 2013 titles. Andy Roddick won his last ATP World Tour title when he defeated Gilles Muller at the 2012 BB&T Atlanta Open. Mardy Fish holds the title for 2011 and 2010. About GF Sports After the successful completion of the BB&T Atlanta Open in August 2015, GF Sports, LLC, a newly formed integrated event content company, formed by the New York-based financial management company GF Capital Private Equity Fund, and its founder Gary Fuhrman, along with long time sports executive, Jerry Solomon and his Lynnfield-based company, StarGames acquired the tournament. GF Sports has committed to reinvigorating the BB&T Atlanta Open brand and bringing a World Class Field-World Class Fun to many local, regional and national tennis fans for years to come. The ATP is the governing body of the men's professional tennis circuits - the ATP World Tour, the ATP Challenger Tour and the ATP Champions Tour. With 60 tournaments in 30 countries, the ATP World Tour showcases the finest male athletes competing in the world’s most exciting venues. From Australia to Europe and the Americas to Asia, the stars of the 2015 ATP World Tour battle for prestigious titles and Emirates ATP Rankings points at ATP World Tour Masters 1000, 500 and 250 events, as well as Grand Slams (non ATP events). At the end of the season only the world’s best eight qualified singles players and doubles teams will compete for the last title of the season at the Barclays ATP World Tour Finals. Held at The O2 in London, the event will officially crown the 2015 ATP World Tour No.1 presented by Emirates. For more information, please visit www.ATPWorldTour.com. Now in its 12th season, the Emirates Airline US Open Series continues to serve as a true regular season of hard court tennis, linking eight summer tournaments to the US Open. In 2014, Serena Williams won the US Open and Emirates Airline US Open Series women’s title for the second consecutive year, earning a record tennis paycheck of $4 million. Rafael Nadal (2013), Roger Federer (2007) and Kim Clijsters (2005) also accomplished the feat of winning the Emirates Airline US Open Series and US Open singles title within the same year. www.emiratesusopenseries.com.